Well I guess for a complete and utter amateur I do alright. 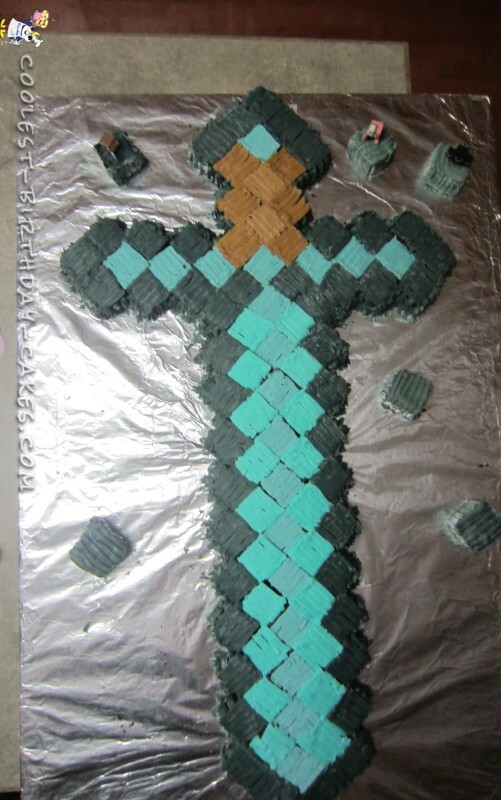 I browsed about 10,000 photos of Minecraft sword cakes when my eight year old son, Bubba, made sure to tell me he wanted the Diamond one. I saved about three varieties to my computer, made a list and then went shopping. I browsed Walmart looking for a brownie pan that you can cook the square brownies individually. Well, that wasn’t happening. So I decided to make two sheet cakes like you would for a pumpkin roll. 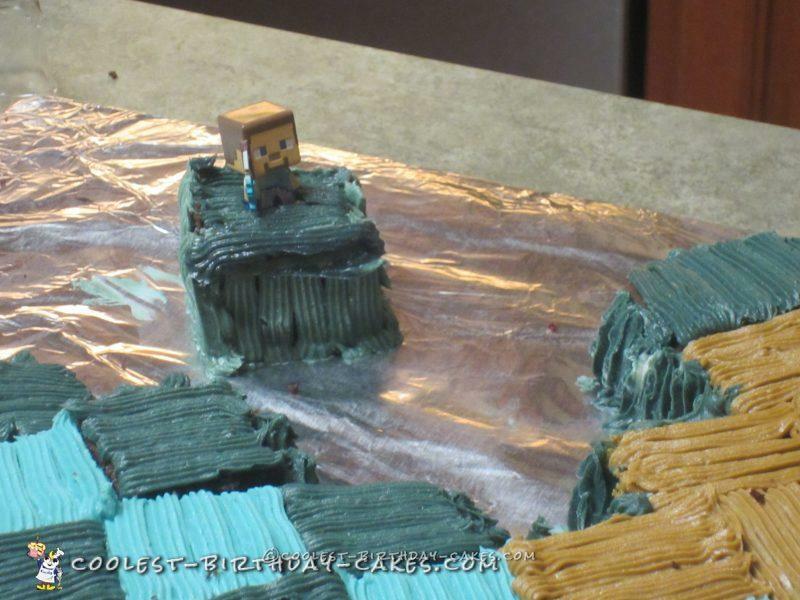 I found some brown, black and blue coloring for the frosting and some tiny little Minecraft characters in the toy section. I got home and started. Made two box mixes and got them in the oven. Then started on the butter cream frosting when i realized I didn’t have enough powdered sugar. Called my honey and asked if he could get me another bag. Meanwhile cakes were done and then we had the fun task of trying to find a ruler in the house that was the required 3cm width. Finally found one and used that to cut my two pumpkin roll sheet cakes into 3cm x 3cm squares. Guess what? Box cake mix is pretty crumbly. I managed to get enough good squares, so I happily proceeded. 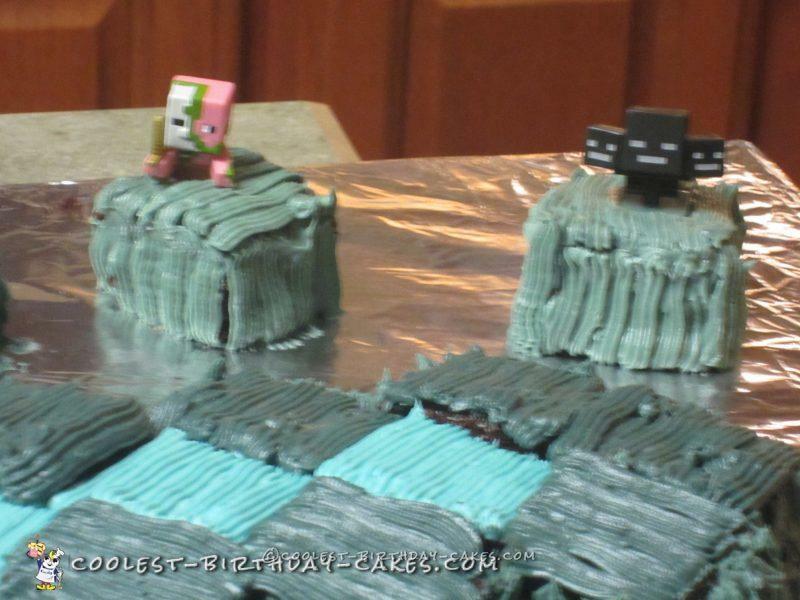 I have to say I have never really played Minecraft, and I’m sure I would stink at it if I did. I couldn’t figure out how to place those little square pieces of cake on my prepared Science project board for anything. Good thing my 11 year old daughter and her friend were there to help me navigate Minecraft construction. Dear Lord, how confusing! I was good in Geography, I don’t get it. I kept hitting the refresh on my computer screen and then counting squares to make sure I was frosting each square with the right color. 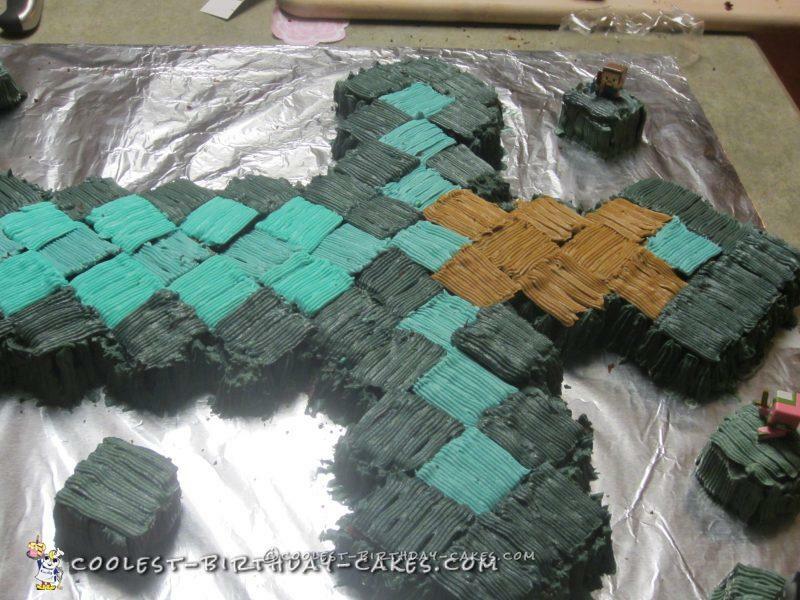 I did a light blue stripe of squares down the center and one in the centerpiece of the handle. Then I did a darker blue around the light blue. I then started the handle with the brown. First attempt at making a dark brown came out looking like something from a dirty diaper, so we used that for the glue to hold the squares to the board. Adding a little black to my light brown didn’t work quite the way I expected. Had to settle on a light brown for the handle. Finally my butter softened and I finished the grew around the edges and then frosted the tops that needed to be grey. I just did long stripes across each square to cover with a tip that had a serated edge. Not sure of the tip number. I’m not a cake decorator. I bought this kit from Pampered Chef one year that had little bottles that the tips screw onto. That worked well. You just squeeze the bottle and the frosting comes out. I finished off my creation with individual blocks that I placed randomly on the board. I then let the kids plunk the three characters I bought from the store into three of the blocks.